The process is simple, but the time to fill that jar is now. As the snow melts, and the spring sun gets warmer and stronger, bright green leaves – nettles, dandelion, violet and plantain – hide just under last year’s brown grass. These four wild plants will be the start of our dehydrated greens jar. Admittedly, “dehydrated greens jar” doesn’t have the ring of, say, strawberries and cream, but come winter (and it will come again), that jar will be my family’s natural penicillin. All next winter, we’ll use generous spoonfuls of the mix in soups, stews and much more to add vitamins and minerals to our winter diet. The days grow longer and warmer, and life erupts all around us. We start our garden, local farmers begin to sell their wares at markets, and we look forward to those first cultivated greens – spinach, kale, and beet greens. Some of these will go into the jar, too. For a spicier flavor, later in the season we’ll add chives and fennel, too. 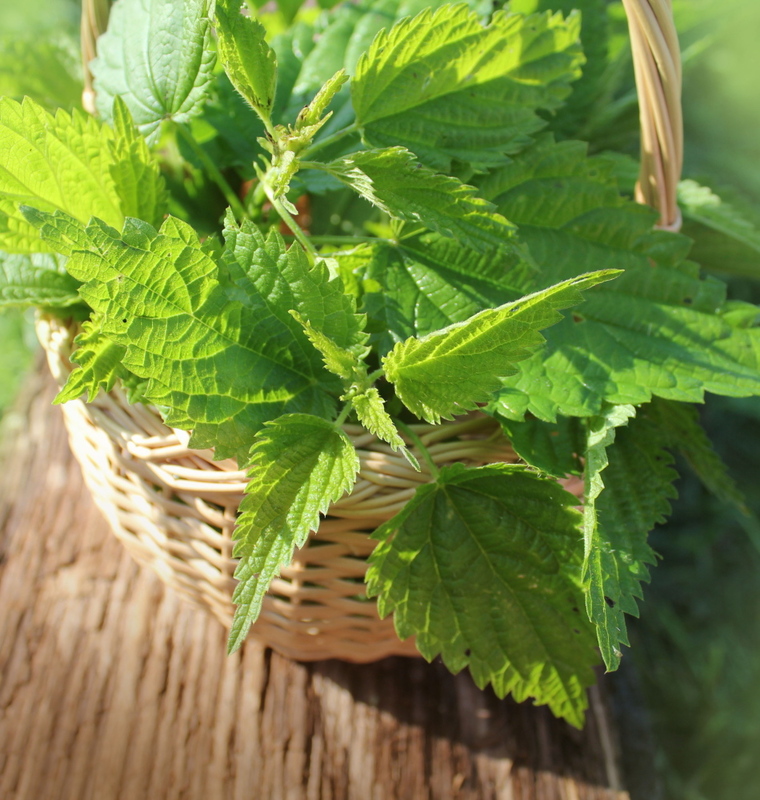 Nettles, as well as other greens, are dehydrated by the author for use in soups, stews and more during the wintertime. Dehydrating greens is as simple as dehydrating herbs: You place a single layer of the whole leaves in the electric dehydrator. The steady, constant heat dries them in less than a day, a relatively quick pace that lets the greens retain most of their nutrients. When the leaves are brittle, I remove them from the dehydrator and put them into a jar, gently mashing, but not pulverizing, to make room for additions as the season progresses. By winter, our family has stockpiled a couple of quart jars, which we seal tightly and store on a shelf, near the herbs. Most food storage references say to use stored food within the year, but absent moisture, mold and bacteria have no place to grow, so while the nutritional value and flavor may diminish, dried foods, properly stored, can be kept indefinitely. Nutritionists tell us that leafy vegetables are brimming with fiber, vitamins, and minerals, and plant-based substances that may help protect against heart disease, diabetes, and perhaps even cancer. While fresh is best, dehydrated greens offer all of the fiber and calories of their fresh counterparts, and most of the vitamins and minerals. Water-soluble vitamins, like Vitamin C, leach out during the drying process, but riboflavin, thiamine, and niacin, which are abundant in leafy greens, are retained and become accessible, especially when added to meals, like soup. The smell of the dehydrated greens is rich and green, but the flavor is subtle and never overpowering, and even people who don’t like the flavor of fresh greens, will eat dehydrated ones. For us, it is an especially ingenious part of our diet, because, like many children, our girls are finicky eaters. Our dehydrated greens can be masked in many foods our daughters enjoy, like soups and stews, sauces for pasta and pizza, and even savory breads, pancakes and muffins. To use them, we scoop the amount we wish to add (usually not more than 2 tablespoons per dish) directly into our palms, and pulverize almost to a powder with our finger-tips. We remove any woody parts, like the stems, at that time. Then we simply stir them into whatever we’re making. We have been dehydrating foods for a long time, but only started dehydrating greens when, several years ago, we had a larger than expected harvest. We knew we could not eat all the greens before they rotted, and we do not, particularly, enjoy frozen vegetables. Since we were dehydrating some herbs from our garden at that time, we thought, why not try? In retrospect, we wonder why we didn’t think of it sooner. As locavores and seasonal eaters living in Maine, finding ways to add nutrients and variety to our winter meals can be a challenge. Dehydrating and using greens is probably the easiest way to preserve the harvest and add a power punch of nutrients to our meals during Maine’s long winters. But you need to start now. Wendy Brown is co-author (with her husband Eric) of “Browsing Nature’s Aisles: A Year of Foraging for Wild Foods in the Suburbs.” She shares her adventures as a suburban homesteader in southern Maine on her blog at happilyhome.blogspot.com.